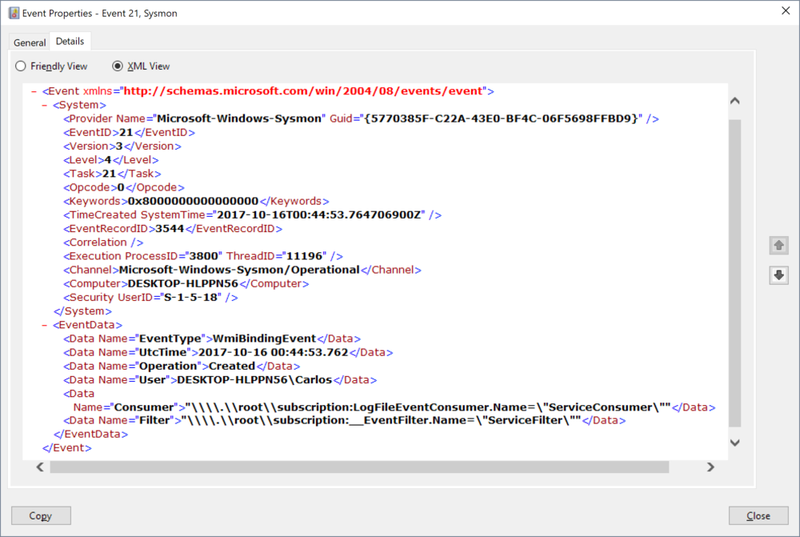 We will use Windows PowerShell to create a permanent event that will track service changes in state in to a text file. We start by creating a __EventFilter that will check for a modification of the Win32_Service class every 5 seconds. Once the event is created we see that a Event 19 is create and under EventData we wee a Data element where the Operation attribute says Created. The creation was logged under Event Id 19. We can see that under Operation it is blank now, this means there is no logic in 6.10 to track modification but it still logs an action we can filter and trigger on. I informed one of the developers at Microsoft about this and they will address this in the next release of Sysmon for all log types. Lets create now a consumer that will create a log file on the C:\ drive with the following Windows PowerShell Code in the existing window where we created the filter. 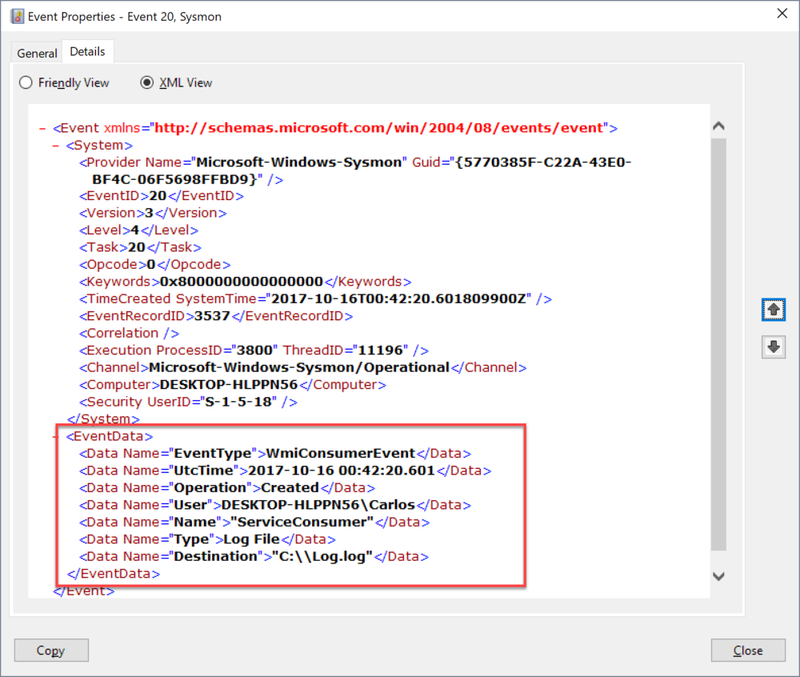 We can see the LogFileEventConsumer creation was logged with Event Id 20 and all properties of it where parsed under EventData Element of the log structure. Lets create a __FilterToConsumerBinding class instance using the __EventFilter and the LogFileEventConsumer class instance we created earlier. The action is logged with Event Id 21 and that the Filter and Consumer paths in the CIM Database are included under EventData. In conclusion I can say that the logging in Sysmon expands on what we can already log in the newer versions of Windows and it provides better consistency and insight on Permanents type events and their components that the current Windows logging does not. It does not over temporary events, providers or query errors but it is a great start. I would recommend to simply enable logging of all events associated with WMI permanent events and to not filter in the configuration file since their creation is not common on aday to day operation and their modification is very rare so the simple presence of the events is enough to warrant a look in a production environment.